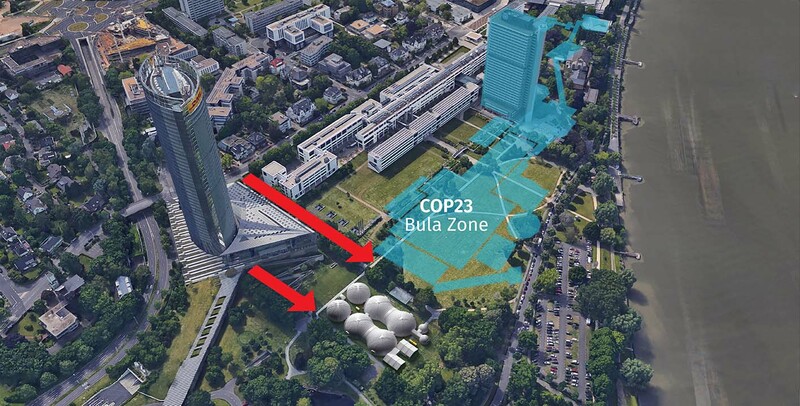 Climate Action are delighted to announce that this years’ Sustainable Innovation Forum ( SIF17 ) will take place on the lawn of the Deutsche Post DHL Group Post Tower, only steps away from the COP23 ‘Bula Zone’. Our partnership with DHL has been formed out of aligned interests and mutual beliefs that innovation is the catalyst behind reduced environmental impact. SIF17 will take place inside an award-winning inflatable structure that will be powered by DHL’s renewable energy with all food waste from the Forum being converted into energy. The stunning 4,000 square meter venue structure will be located on DHL’s lawn, in the shadow of the 162.5 metre Post Tower - a building powered by 100% certified renewable energy, using a cooling system that allows it to consume 30% less energy. Climate Action – the organisers of SIF17 have limited availability for organisations aligned with Climate Action to utilise the stunning venue space either as a side event to SIF17 on the 13th and 14th November or as a stand-alone event outside of those dates, throughout the two weeks of COP23.